I am busy painting beautiful Little Darlings and am ahead of schedule! a new pattern, or start an eBay auction. Little Darlings: A gallery of dolls that I paint and offer to collectors. I accept Custom orders but it will be about 18 months before you receive your doll. Fashion Patterns: My doll clothing patterns include the easiest step by step instructions you've ever seen, because I include photographs of each step of the sewing process! 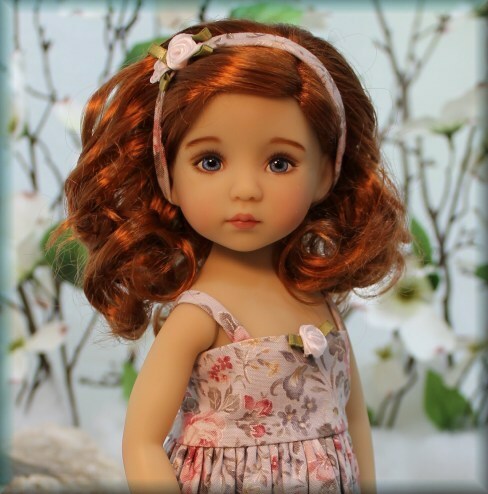 Create beautiful fashions for your favorite dolls! I have a large selection of patterns for 13" Little Darlings, American Girl Dolls, 11" and 18" Kaye Wiggs Ball Jointed Dolls, 24" Ball Jointed Dolls, Ellowyne Wilde, 14" Kish Chrysalis, 10" Ann Estelle or Patsy, My Twinn Dolls, Leeann, and Mini Super Dollfie. Fashion Gallery: This is where you will find a history of past (already sold) designs. It will give you an idea of the scope of my work. Design Museum: These are designs from 2000-2002. I have been sewing for my dolls since I was a little girl, and designing clothing for real people before, during, and after my years at College La Salle (the preeminent design school in Montreal). These Galleries document my first two years of designing for the internet doll world. I am happy to have found my niche as a doll artist and fashion designer for beautiful dolls, and I hope you enjoy looking at my design work from these exciting first two years. Q: I read a little about your history designing for the Canada Ballet, could you tell me a little more about your background in clothes design and construction? I had quite a bit of experience before entering Fashion School in my twenties. Starting at three or four I was playing with dolls and dressing them. I started creating my own clothes for the dolls with scraps from my mother's sewing efforts, before I was allowed anything but child's scissors and big blunt needles. This morphed into sewing cloth dolls for sale during my teenage years and I started sewing my own clothing. I also started doing alterations for many people in my neighborhood and then took a piecework job with a local clothing manufacture at 15, and learned how to sew on industrial sewing machines. This led to starting a dancewear company with my sister who was dancing for the Les Grands Ballets Canadiens. We designed and sewed unitards, leotards, leg warmers etc. This business continued for several years, and as my sister moved up in the world of ballet (The National Ballet in Toronto) and I gained new customers for my designs. Then I made a mistake and ended up as a single mother - two children and a divorce before I turned 25. But that was a minor detour for me, and with my father's help I enrolled in College LaSalle in Montreal to study Fashion Design. While in Fashion School I designed costumes for choreographers of some smaller ballet companies. My classes in Fashion School filled in what I didn't already know, especially about how to drape and draft professional patterns. I studied fashion history and had a very inspirational teacher for Fashion Drawings. The high point of those years was winning a fashion contest that let me represent Canada in an international competition held in Paris. The theme was "Cruise Wear" and my entry was titled "The Pirate's Fiance". It was thrilling to see my design compete on a Paris Fashion Runway with a professional model dressed in my creation! Right about this point in my life I met and then married my husband, Bennett, and moved with my two young children to Vermont, a land of green mountains and cows... No fashion industry at all! So I opened my own shop called "Fashion By Magalie" where I had a thriving business making custom sportswear, Winter fleece wear, and personally fitted bathing suits.This became too much to manage while raising my children, so I took a position as creative designer for a small doll company and designed two complete lines of cloth dolls with extended fashion collections. Then in 1999 I discovered eBay and the rest is history. I had finally found a viable outlet for my childhood passion! Q: Your patterns are completely unique and original, where do you get your inspiration? Every doll 'model' I have is an inspiration for me, but I'm also inspired by fabrics, textures, and jewelry. I usually work with a movie going in the background and have an extensive collection of old movies. The Wizard of Oz, The King and I, Gone with The Wind, Doris Day, and other vintage movies that are filled with the most beautiful fashion inspirations! I also have a big collection of fashion books and magazines, paper dolls, and vintage sewing patterns. My favorite designers are Erte for his fantastic fashion illustrations, Schiaparelli for her shocking boldness, and Christian Dior for bringing femininity back into the fashion world with his "new look". I love to mix and incorporate different eras of fashion into one design. My only rule is that it has to be pleasing to MY eye. I don't replicate fashions, but strive to create my own personal look. While in Paris I visited the haute couture houses: Dior, PerSpook, and Nina Ricci. I saw some of their original fashion sketches that showed how they draped and created first drafts of patterns. This is how I want to keep my patterns - hand drafted and hand illustrated in the haute couture fashion, which is becoming somewhat of a lost art in today's computer driven world. Q: I've noticed on a few of your pattern covers a beautiful drawing of the outfit, is that drawn by you? Yes! I've always loved drawing, and fashion illustration is an art that I wish I had more time to practice! 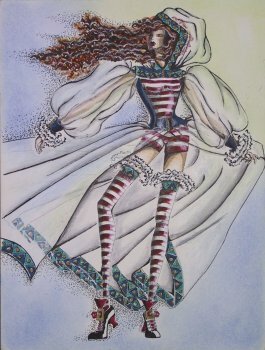 When I started sewing one of a kind designs for Gene Marshal, I included the original fashion illustration with the ensemble but soon found that there was not enough time for this. Plus, I started offering Limited Edition designs, so I decided to focus my time only on the design. Now that I'm creating patterns, I've decided that the illustration is an important part of the look of my patterns and all future patterns will have my original fashion illustration on the cover. Q: Could you take me through the process of designing a pattern, from inspiration to final completed pattern? The genesis of a pattern varies, but most of the time I start by playing with fabric combinations, and different colors and textures, draping on a doll until I decide the basic direction I want to go. Then I make a rough sketch or three to explore the budding concept. Then I just cut the fabrics and sew, sculpting and adjusting as I go. I always use the type of fabric I intend to use for the finished design so I can see how it will fall, thus creating my prototype. Then I do a 'master plan' of the prototype, sometimes using basic slopers I have made for each doll, other times starting from scratch depending on the style of the design. This is where the first draft of the pattern pieces are made. Then I add seam allowances, and cut a second sample from these pieces to make sure that everything fits, that all the pattern pieces work together perfectly, while working out the easiest way to sew the garment. This may take several tries, adjusting the pieces or assembly methods until I have figured out the best and fastest way to sew the garment. When I am totally happy with the pattern pieces I transfer them to cardboard, and place them to fit on a standard piece of 8.5 by 11 inch paper so that my customers don't have to buy special paper to print my patterns. Then I write and draw everything that needs to be on the pattern pieces, scan the pages, and then cut fabric from these final pieces to use in sewing the Pattern Proofs for the pattern. I sew as many pattern proofs as needed to show the different styles contained in the pattern (long skirt, short skirt etc. ), with Bennett taking pictures of each step as I sew the garment. Once the basic garments are finished, I embellish them to use as examples on the pattern cover. Then I use my notes and the photographs to write the instructions for the pattern, all of which is then put together in a finished MHD pattern format by my husband. Special Note On Pattern Making: In my fashion school, we had a class on CAD pattern making, and a wonderful computer program for fashion illustration with dozens of templates of different figures, and different types of clothing that you could use as a base to design your own pattern. I watched as some of the students get lost in the system, relying on the computer programs for everything, never actually designing beyond what was already in the computer program, and making fashion drawings that were completely computer generated. This is not really designing in my opinion. It is pattern making, but it's not very original. I much prefer the manual method of design, pencil and eraser, markers and watercolor. But this is just my personal preference, a matter of taste. Hand drafted or computer drafted patterns can be 'as good' or 'as bad' depending on the ability of the designer. For example, if you are a member of the Tonner Doll Club, you received hand drafted patterns and slopers for various dolls. These are 'professional quality' patterns from a high quality doll company! Hand drafted patterns are just as "professional" as computer generated patten pieces, and often fit the doll better! Q: If a customer has a question or problem with a pattern, how easy are you to reach, and how can they get a hold of you? I absolutely encourage everyone to email me with any questions they have while working with my patterns, and I will promptly reply, walking them through the problem area until they totally understand the process. Some steps are VERY difficult to get a photo showing details. I also love to see the results, and seeing auctions for garments sewn from my patterns is very rewarding to me. I sincerely believe that anyone, novice to experienced seamstresses, can understand and sew from my patterns. My objective is to encourage the novice seamstress to surpass what they 'thought' they could do, and Boldly cut into fabrics! It may take a few tries, but the results are so much fun. It doesn't take yards and yards of fabric to sew for dolls, so mistakes are not too expensive, and you learn a LOT from each effort. Besides, I truly believe that there is always a way to turn a 'mistake' into a 'success'. June 2000.This counter records actual page views by real people. We have had over 20 Million "Hits" since establishing this website.